The Aska and Riki clans have been enemies for centuries thanks to an argument between the two gods they worship. Every five years warriors from both clans travel to the battlegrounds and there is a huge scale battle to the death as they fight for the honour of their clan. Seventeen-year-old Eeyln is an Aska warrior who has spent the last five years training to take part in her second battle against the Riki, the last time she watched her brother Iri die and now she's determined to get payback. Eeyln couldn't be more shocked when she sees Iri on the battlefield, not only did he somehow survive his injuries but he has now switched sides and is fighting for the Riki. When Eeyln is captured and taken back to a Riki village she is surrounded by enemies, people she has fought against for her entire life. The biggest enemy of all is the brother who betrayed her and her father though, how can she ever forgive him for staying with the enemy instead of returning to them? Everything changes when the village is attacked by a third clan, a group with enough warriors to wipe out both the Aska and the Riki, unless two enemies are prepared to do the unthinkable and fight side by side against a common enemy. 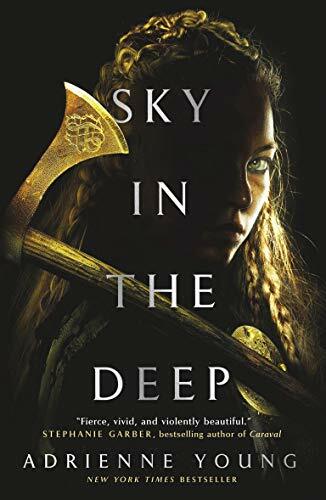 Sky in the Deep is a fabulous debut from Adrienne Young, from the very first page you are thrown straight into the action watching Eeyln fight for her life in battle. This book doesn't shy away from the death and destruction caused by war and Eeyln is a fierce character who fights hard for her honour and to protect her clan. Even when she is captured she doesn't take it lying down, she fights at every turn for the chance to escape and make it back to her family. She ends up being taken in as a slave by the family that have adopted her brother but it is too dangerous for anyone to find out about her connection to Iri so they have to keep their relationship a secret. Eeyln is as bitter and unhappy about her new situation as you'd expect so she's not the easiest character to be around for the first half of the book but as she gets to know the Riki she realises that they aren't really all that different to her own clan. They love and laugh just like the Aska and all they really want to do is survive. It makes Eeyln start to question everything she's been brought up to believe and wonder whether perhaps the enmity between the two clans is pointless. This book is very much about found family and about realising that deep down, no matter what clan they call home, people are all the same. I really enjoyed seeing Eeyln soften towards the Riki as she got to know them better and I loved the interactions between her and her brother but I really would have liked to spend more time seeing them resolve their differences. I liked Fiske as a character and the beginnings of the romance that starts to develop between him and Eeyln but I felt like it needed a little more depth, I thought it might be expanded upon in the next book but that seems to be more of a companion novel featuring different main characters so I'm not sure if we'll see much of the characters we've met here. I do desperately want to read it though, it was really fun to read a viking inspired story and I'm looking forward to spending more time in this world. Source: Received from Titan Books in exchange for an honest review. Nice review. I liked this one a lot and am definitely looking forward to that companion novel! Glad you liked it too.